This week, I drove down to the guys at Turbo Dynamics near Bournemouth to deliver a certain turbocharger belonging to a certain 330d Touring (it’s being transformed into a hybrid turbo as we speak). 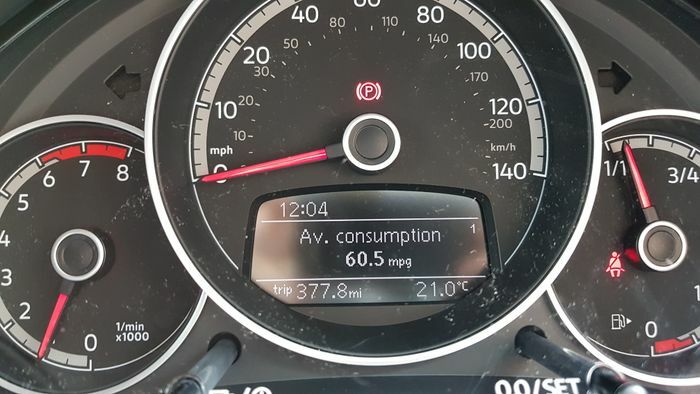 Usually for long trips on the motorway, I’ll avoid taking the GTi because it has a tendency to drink through fuel when being driven at a constant 70-80mph; well, it did have a tendency, because as I found out this week, the Up’s 1.0-litre, three-cylinder engine has loosened up by what feels like a considerable margin to return some really impressive economy figures…. 60.5 mpg on the (dusty) dials! 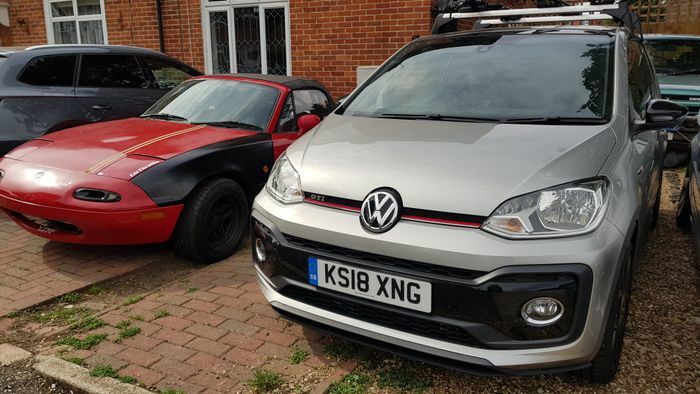 The reason I’m so impressed with 60.5mpg (driven mainly on the motorway at 70mph), is because I was struggling to break into the mid-40s on the motorway when the GTi first arrived at my house with only delivery miles. The car has now covered 4750 miles, so the engine is beautifully run in and working at full efficiency; the stop-start system also helped achieve +60mpg when I hit traffic as I got back into London. So it just goes to show that I was wrong about this little three-cylinder-engined warm hatch, because despite what I thought, it’s way more economical on motorways than I originally thought; even with the bike and kayak rack on the roof, both of which produce a fair amount of drag. 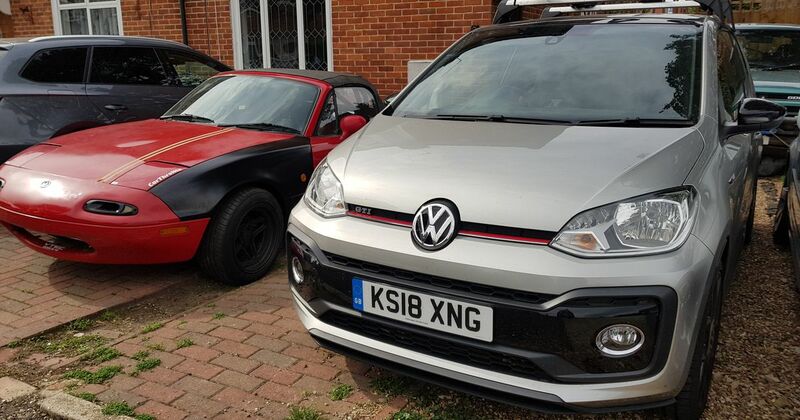 As a motorway cruiser, then, the GTi is actually really good; it’s punchy for quick overtakes, is surprisingly economical and, with the volume turned up on the crisp Beats audio system, is a good car to alleviate motorway boredom. Beside my little economy update, the Up GTi is still a car I enjoy driving. I get asked a lot if it’s actually fun, to which I always answer with an emphatic yes. 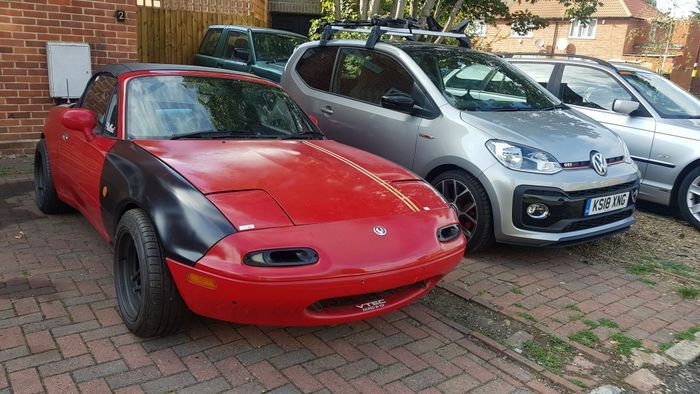 No matter what speed you’re doing, it’s super punchy because it weighs nothing and it changes direction really well, again because of that low weight figure of 1070kg/2359lbs which, incidentally, is almost exactly the same weight of my MX-5. If you’ve got any specific questions about the Up GTi, let me know!